Dividends and share buybacks are both important to investors, but one is more important to the tech giant's management. If you're an Apple (NASDAQ:AAPL) shareholder or are thinking of becoming one, then it's probably a good idea to have some understanding of the company's capital allocation policy. Apple generates a lot of free cash flow, and it's not shy about putting that cash into its investors' pockets through its share repurchase program, as well as its significant and growing dividend. Here are the key elements of Apple's capital allocation policy that investors should know. As of today, Apple's quarterly dividend sits at $0.73 per share, which adds up to $2.92 per share annually. At current share prices, that translates into a dividend yield of around 1.73%. This isn't the biggest yield that you can get from a tech company -- there are some great ones whose stocks yield more than 4% -- but it's better than nothing, and the company has been raising its payout at least once a year since 2012. Also, keep in mind that while Apple seems committed to paying dividends, CFO Luca Maestri was quite candid on the fiscal second-quarter earnings call in May (the company generally announces its capital return updates around that time each year) that dividends play second fiddle to share buybacks. But when it comes down between dividends and buyback, our view is that for a variety of reasons we see a lot of value in the stock. We believe the stock is undervalued and so we have a bias toward the buyback. So the dividend is a very large component of capital return because we're going to be returning more than $13 billion a year to investors through dividends, but we believe that given where we are with the valuation of the stock, we think that we continue to do the buyback primarily. 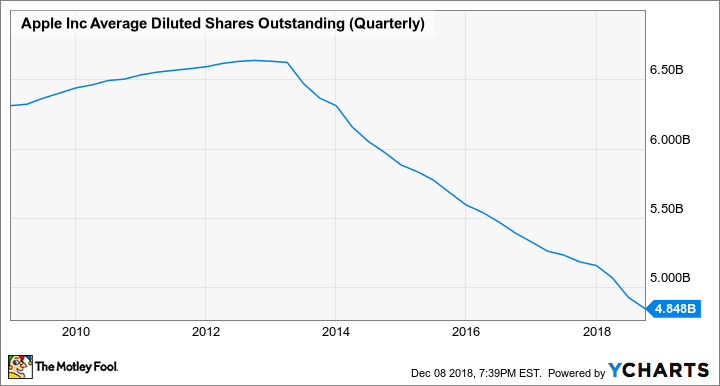 The reduction in share count is a good thing for shareholders because it means that the company's net income is split among fewer shares, boosting earnings per share (EPS). The company said in its most recent quarterly filing that, as of Sept. 29, 2018, it had used $29 billion of the $100 billion repurchase authorization announced on May 1, 2018. This means that it can still buy back about $71 billion worth of shares under its current program. Apple has a solid capital return program in place that ultimately does right by its shareholders. It has a respectable and growing dividend, and an aggressive stock buyback program, which should ultimately help boost its EPS.